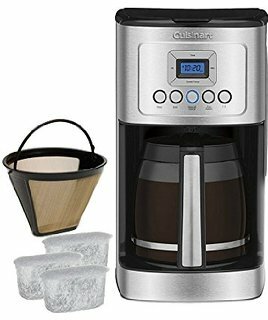 Our Cuisinart DCC-3200 Review will elaborate on why this is a coffee maker you should pay attention to. This beautiful stainless steel machine has plenty of coffee making capacity with its 14 cup pot. It’s integrated temperature control and programmability make it a very convenient appliance for your home or office. 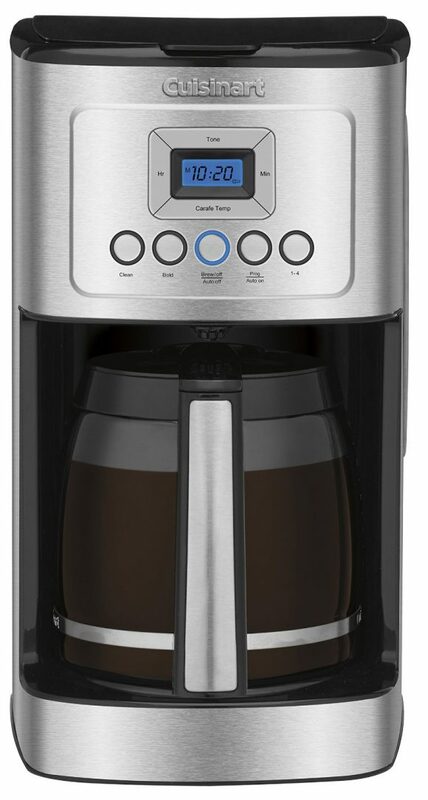 Countless reviews on the web rave about just how good this coffee maker is. The DCC-3200 comes with a 3 year warranty from Cuisinart which exceeds the industry average of 1 year. In addition, there are extended warranty options offered by Amazon upon checkout. Below we have listed the features that make this such a superb coffee maker. As stated before, this unit comes with a generously sized 14 cup coffee pot. This BPA-free glass carafe has an integrated ergonomic stainless steel handle. The lid is very easy to remove and the carafe has measure markings along the side. The brewing temperature can be controlled using the Carafe Temp button on the face of the unit. The user can choose from low, medium, or high based on their preferences. This feature is especially useful for those that use a lot of milk in their coffee. The increased brewing temperature will combat the effects of cold milk; providing a perfect cup of coffee. Cuisinart states that the increased temperature will not jeopardize taste in any way. In addition to temperature, the user also has the ability to determine the coffee’s strength. This is done using the Bold button to brew a richer and stronger cup of coffee. Alternatively, the user can leave the Bold button deselected to brew a regular pot of coffee. Located on the side of this machine is a water window. This tells you exactly how much water is left in the unit so that you know when it needs to be refilled. A blue-backlit LCD display makes it easy to adjust the unit’s settings and view the current time. If you’re not interested in brewing an entire carafe of coffee, you can use the 1 to 4 cup feature to brew in smaller quantities. This coffee maker is programmable with its 24 hour scheduling ability. Simply input the time that you want the unit to operate and a fresh pot of coffee will be brewed daily at that time. The Auto Off feature will automatically turn the machine off from 1 to 4 hours in the future. A Self Clean button will clean the inside of your DCC-3200 so that you can continue to enjoy coffee without having to manually clean it. When brewing has finished, the ready chime will alert you. The user has the option to disable this feature if they choose by using the Tone button. A Brew Pause feature allows the user to pour a cup of coffee before the brewing process has completed. Also included is a Gold Tone permanent coffee filter. 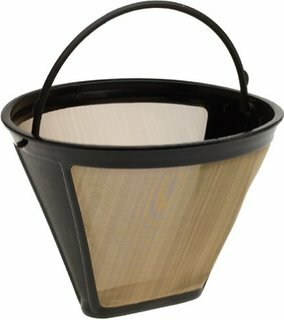 This economical filter eliminates the need to use disposable paper filters. However, a paper filter can be inserted into this filter if you wish to have your coffee filtered further. An included charcoal water filter will remove any contaminants found in the water prior to brewing. 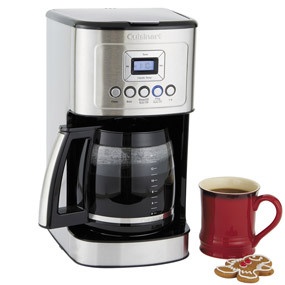 This Cuisinart coffee maker measures 14.25″ wide by 9″ high by 8″ deep and weighs 9.5 lbs. 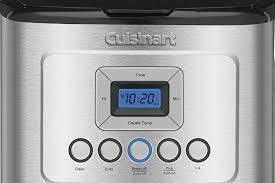 With 85% of reviewers giving this a 4 to 5 star rating, it’s no wonder that Cuisinart has been able to sell so many of these units. One of the major things people love about this coffee maker is its appearance. The stainless steel design makes it look like a professional coffee maker and commands attention in their kitchens. People really appreciate the Brew Pause feature. They like being able to pour themselves a cup of coffee before the entire carafe has finished brewing. The water window on the side of the unit is another favorable feature that users cite. It takes the guesswork out of water refilling like many of their past machines. They’re aware of how much water is in the unit at all times. Most importantly, users state that the DCC-3200 brews an amazing pot of coffee. People are surprised that this machine is capable of brewing such good coffee for the price they paid. Another attribute that many reviewers cite is the Auto On feature. They like waking up in the morning to a freshly brewed pot of coffee with no effort on their behalf. Those who use a lot of milk in their coffee state their appreciation for the ability to adjust the brewing temperature. They don’t have to drink moderately warm cups of coffee anymore. Lastly, purchasers state that they like having the option of brewing stronger cups of coffee using the Bold button. They enjoy being able to make a stronger cup of coffee as needed. We love the Cuisinart DCC-3200. It does everything that it claims to do and does it very well. This coffee maker gives the user the ability to adjust a ton of different settings including brew strength, temperature, quantity, and scheduled timing. The Brew Pause option is another option that we really enjoy. We like being able to pour a cup of coffee mid-brew instead of waiting for the entire pot to be finished. The customer satisfaction rates for this coffee maker are off the charts. People absolutely love it and have had it in their kitchens trouble-free for quite some time. Cuisinart is no stranger to the kitchen appliance market and the DCC-3200 is just another testament to the outstanding products that they put out. If you’re considering buying a new coffee maker, you can’t go wrong with the Cuisinart DCC-3200! We hope you liked this Cuisinart DCC-3200 Review. Please feel free to share or leave comments below! Does the stainless steel handle on carafe gets heated as the coffee is brewed? We have not had that experience while using it. Anytime. We hope you enjoy this machine! Wow, this coffee maker has alot of good features. I like that you can set the coffee temp because I always make coffee and then have to wait like 30 minutes for it to cool down enough to drink. And by the time I don’t even want the coffee anymore!! It says that it is self cleaner. How does it clean itself? There is an integrated cleaning and descaling program so that you do not have to do it by hand. The machine will automatically perform these functions. It is a wonderful coffee maker! A very nice and detailed review. Coffee is one of the best drinks you can get today! (besides tea). I’m considering purchasing one of these, especially because it is so beautiful . Do you think this unit will last a long time becuz my last one went out on me in under 1 year? This coffee maker should last you well beyond one year. Even with above average use. There are tons of reviews of people who have had this unit operating flawlessly for years. You shouldn’t have anything to worry about! In the rare event that the unit did fail, it comes with an impressive 3 year warranty from Cuisinart. Who doesnt love coffee! This cuisinart seems like a great appliance for any kitchen. A little out of my price range right now but surely something I will keep in mind. I’m not a fan of the keurig or tassimo type machines they have now so this would be great. Thanks for the review it was excellent. If you’re not a fan of the K-Cup format with machines such as the Keurig K55, the DCC-3200 is definitely a good fit for you. It is a bit pricey but well worth it! Best of luck! Oh my gosh, I have to have this coffee maker. It has everything I want. The 14 cup capacity is a bonus. I love the idea that it cleans itself as I have hard water and it can clog up a coffee maker after a while. The different temperatures is awesome. I have never seen it before on a coffee maker. I am definitely getting this one. Thanks didn’t know it existed. This coffee maker has tons of useful technology. You will love everything that it has to offer. Best of luck!